A common question that families interested in our school ask is “why choose Montessori?” As you embark and what is arguably the biggest decision of your son or daughter’s life thus far, we understand it is important that you have a complete understanding of our educational philosophy. Montessori moves from the concrete to the abstract. The child is able to interact with concepts and ideas, rather than simply memorize facts. Montessori facilitates a natural love for learning that extends far beyond the classroom walls. The idea of following the child honours how much the child sees, enjoys and discovers about the world. 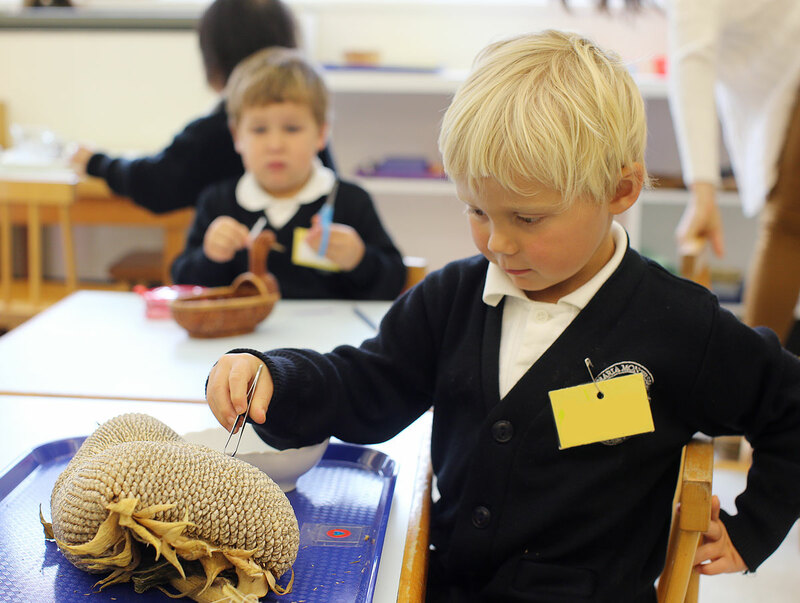 The Montessori materials naturally bring about the inquisitive nature of the child and allows for them to think for themselves and and discover new ways of doing things. They open up the child to learn for themselves and teachers them how to discover, but doesn’t dictate what they should do step by step. A well rounded Montessori education seeks to educate the whole child taking the education outside the classroom. It affects how they interact with others, teaches self care, grace and courtesy and teaches them how to be active participants in their learning. Montessori equips the child for every day life giving them practical skills which gives them purpose and empowers them as they become contributing members of their community. A true Montessori environment abstains from rewards and focusses on intrinsic motivation and the idea that children will learn to make decisions based on what feels good inside their own selves. There is no reward for learning other than the intrinsic joy the child receives when they discover something new or realize they’ve acquired a new skill. Montessori focuses on the individual child and their own potential as opposed to assuming that children are just empty vessels which we are to fill with knowledge. A Montessori classroom acknowledges that no two children are at the exact same space in their development so it is not expected that all children study and progress through the material at the same pace. In a Montessori environment, students don’t have to wait for other students to catch up nor do they have to feel badly when they are presented with a concept above their ability level. These are just a few of the many reasons to choose a Montessori Education. We would be happy to go into further detail during our tour. Please get in touch with us to request a tour.